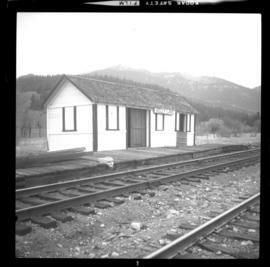 Photo displays the Pacific Great Eatern Railway depot in Kelly Lake on mile 192.7. 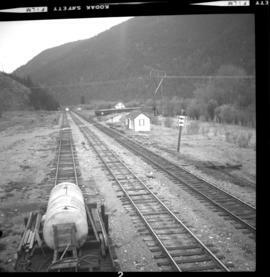 Photograph depicts the remains of Pacific Great Eastern trackage beside a primitive small grain elevator laeding off at the end of the "Y" at Kelly Lake. It was probably not in use for the past 20 or 30 years, as of 1972. 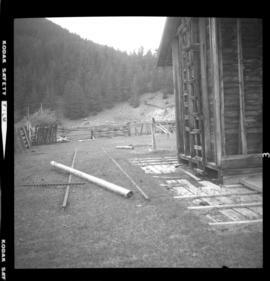 Photograph depicts gondola cars sitting on a turning Y, unloaded, and covered with plastic. They were awaiting switching to an ore mine loading loop about 5 miles up the line.